We are extremely happy that FileMaker has released FileMaker Go for iPhone and iPad. How great is that? But, we are sorry to say that because of the way iPhone works, we can’t recommend or support use of FileMaker Go with current versions of Studio Manager. Don’t stop reading, though, there’s more to this story. You could access Studio Manager from an iPhone or iPad running FileMaker Go with just a couple tweaks, but you risk getting into trouble and having a frustrating experience. For one thing, FileMaker Go doesn’t support Preview and the iPhone and iPad don’t yet support printing. All reporting for iPhone and iPad will have to be re-done in a way that doesn’t require a Preview. Right now, all reports in Studio Manager require previews or printing. So, if we support 5 or 10 reports from the iPhone or iPad, they will be new reports that work even though previewing is not possible. 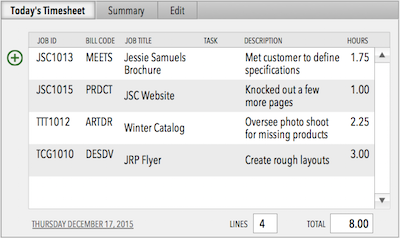 FileMaker 11 allows subheads and subtotals to appear without a preview. Previous versions don’t. The absolute deal-breaker issue is that when you use an iPhone or iPad, hitting the Home button shuts down an app abruptly which means a script can stop before it is done. If you are running a script that happens to move data from point a to point b or even creates a new timesheet, it could be interrupted mid-script leaving loose ends and incomplete information. We are available to address this now on your behalf with your current version of Studio Manager, but it’s going to take some careful research to make sure we’ve nabbed all the scripts that would be troublesome on an iPhone or iPad. The secondary issue is that Studio Manager layouts are built and optimized for a Mac that uses a cursor. There is a consensus and we agree with it that you should make your layouts touch-friendly if they are going to run on a touch-based device like the iPhone or iPad. Because of these two issues, we think the way to go is to create some little layouts for the iPhone and some for the iPad. We’ve already got an itty bitty iPhone layout for login and another for task and time updating running in our lab. Some good and thorough thinking will be needed to decide what functionality will run well and will be essential on the iPhone and iPad. We will either make iPhone and iPad versions of important scripts or modify the scripts to do different things depending on the type of device that’s being used. 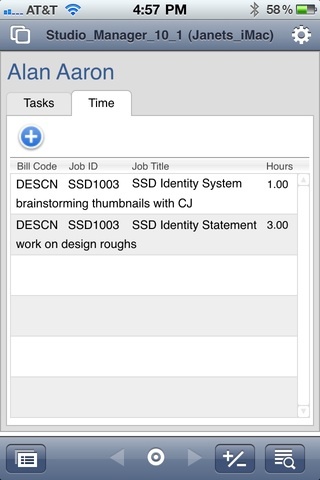 We plan to do three things to support FileMaker Go. First, we expect that the next major release of Studio Manager will include at least a modicum of features that can be used well with iPhone and iPad. Second, we plan to publish our work so that you can as easily as possible add compatibility to an earlier version of Studio Manager. Third, we’ll offer customization services and consulting to our customers so that they can make changes they want in their current version of Studio Manager. We think FileMaker Go will be the very best way to access Studio Manager for people who are occasional or temporary users, have an iPhone or iPad, and don’t need absolutely full access to Studio Manager features. Better than web access. It is fun to use. It’s handy. At $20 for iPhone and $40 for iPad, it is the cheap, thin and mobile client we’ve been waiting for. Please comment on this post if you have some ideas. If you have a top priority, let us know. We need your input!